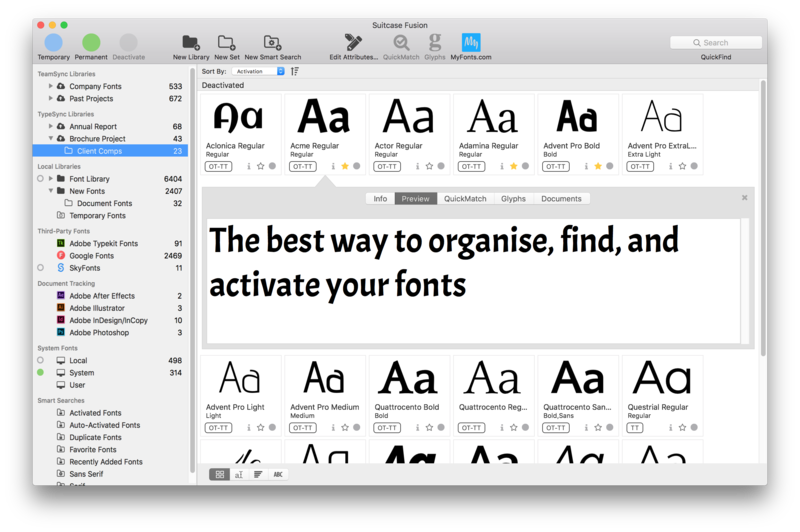 Organise, find and activate fonts in your creative applications with Suitcase Fusion — the font manager trusted by more than 100,000 creative professionals. Powerful enough to manage font collections of any size — from hundreds to hundreds of thousands of fonts — and versatile enough to maximise your efficiency and productivity, while inspiring your best work. Manage all of your fonts from one source, no matter how many you have — including your systems fonts, purchased fonts, fonts synced from Adobe TypeKit, Google Fonts and more. Turn them on and off as you need. Whether you’re searching for a specific font, discovering others that enhance your creative work, or recalling fonts you’ve used in previous projects—Suitcase Fusion helps you find the fonts you need. Auto-activation automatically brings your font collection into creative applications, patented Font Sense technology ensures the right font is activated as soon as you open your documents, and font tracking guides you back to fonts you’ve successfully used in the past. With your entire collection of fonts in one place and accessible where you need them, you’ll always deliver consistent and accurate font usage without frustration and wasted time due to missing fonts, font conflicts, or font errors. 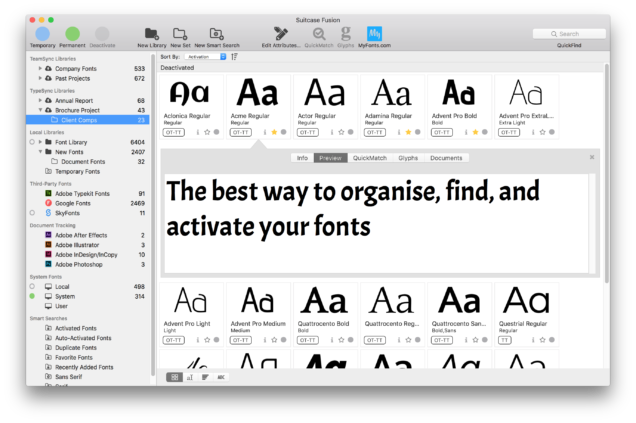 Organise your font collection by project, client, or however you see fit — and access your fonts with the professional tools you already use. On both Mac and PC, Suitcase Fusion automatically brings your entire font collection into Adobe Creative Cloud applications through plug-ins and panels. Get FontDoctor for free when you purchase Suitcase Fusion. You’ll be able to keep bad fonts from derailing your work as FontDoctor quarantines corrupt and malformed fonts, repairs common font problems, generates detailed reports about bad fonts, and weeds out improperly organised font suitcases. Speak to our specialists at RGB Solutions today to find out how Extensis font solutions can support your workflow.